I think I cannot write about this, but I am really impressed. 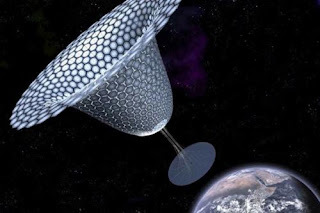 "SPS-ALPHA (Solar Power Satellite via Arbitrarily Large Phased Array) is a novel, bio-mimetic approach to the challenge of space solar power. If successful, this project will make possible the construction of huge platforms from tens of thousands of small elements that can deliver remotely and affordably 10s to 1000s of megawatts using wireless power transmission to markets on Earth and missions in space. The selected NIAC project will enlist the support of a world-class international team to determine the conceptual feasiblity of the SPS-ALPHA by means of integrated systems analyses, supported by selected "proof-of-concept" technology experiments."